A bright and breezy day greeted 12 skippers to our water for this years Coventry Trophy. Colin Goodman taking the honours on the day with Vernon Appleton, Mark Dennis and Dave Allison battling it out for the next three places. Vernon and Mark scoring equal but Vernon taking second place on a count back with Mark just 2 points behind. This event is open to all MYA Members with a certified 6M boat. Members should use the MYA Online Entry Form if possible, or email Peter Sutton (peterandcheryl@virginmedia.com) and David Grint (dwgrint@virginmedia.com) – please ensure you include your name; MYA No. ; Sail No; Frequency; Hull Type and emergency contact name and number. There will be a skippers briefing at 09.45am with racing starting shortly after at 10.00am. No race will start after 4.00pm and any race in progress at 4.30pm will be abandoned. MYA Standard Sailing Instructions (SSI’s) will be used and skippers should note that they will be required to undertake to sail in accordance with the RYA Racing Charter. 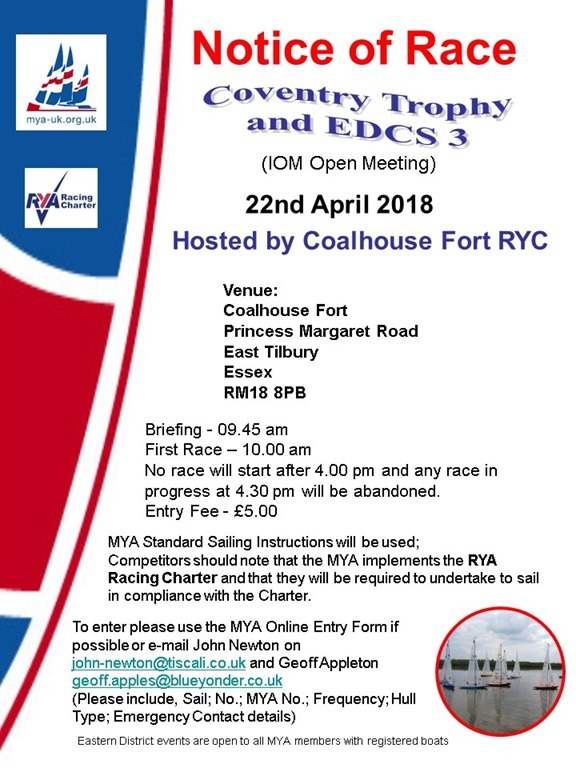 Please be advised that the Coventry Trophy and Round 3 of the Eastern District IOM Championship Series, will be hosted by Coalhouse Fort RYC. The event will take place at Coalhouse Fort Princess Margaret Road, East Tilbury, Essex RM18 8PB on Sunday 22nd April 2018. There will be a skippers briefing at 09:45am with the first race following shortly after. No race will start after 4:00pm and any race in progress at 4:30pm will be abandoned, unless a vote of participants indicates finishing earlier. All MYA Members with a Certified boat are welcome and should use the MYA Online Entry Form if possible. If not please email Geoff Appleton (geoff.apples@blueyonder.co.uk) and John Newton (john-newton@tiscali.co.uk) ensuring you include, Name; MYA No. ; Frequency; Sail No. ; Hull Type; and Emergency contact name and number. MYA Standard Sailing Instructions (SSI’s) will be used and skippers are reminded they will be required to sail in accordance the RYA Racing Charter. 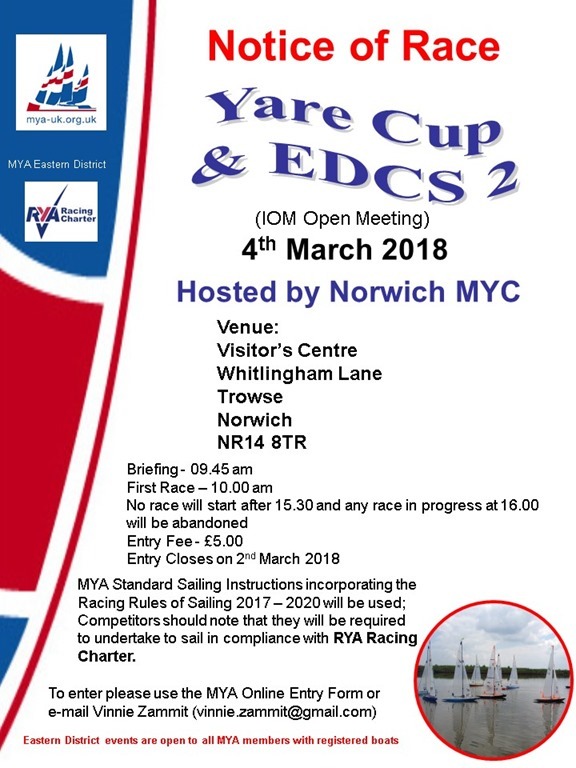 Due to the inclement weather, Norwich MYC have reluctantly decided to postpone the Yare Cup, scheduled for 4th March 2018. a new date for this event will be advised as soon as possible. For and on behalf of Vinnie Zammit, Norwich MYC. 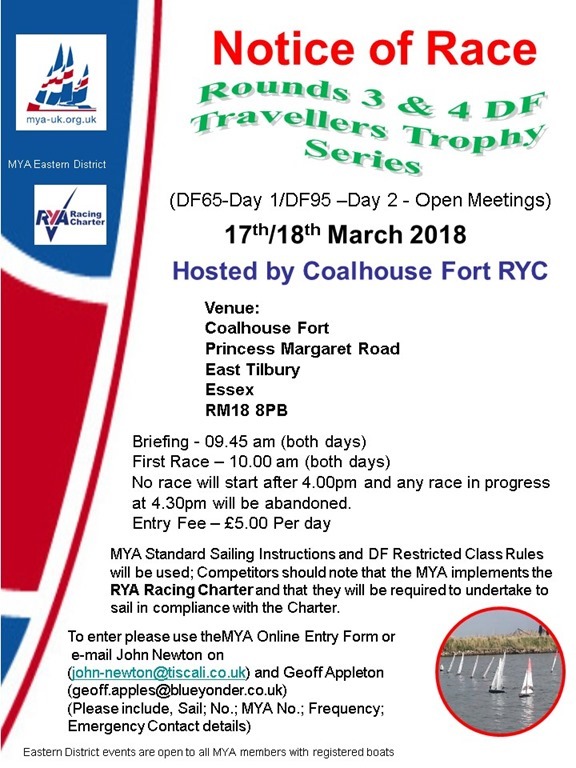 Coalhouse Fort RYC will be hosting Rounds 3 & 4 of the DF Travellers Series at their Coalhouse Fort, Princess Margaret Road, East Tilbury, RM18 8PB venue, on Saturday 17th March (DF65) and 18th March (DF95). Please drive safely through the village and park as requested on the grass in front of the Fort as directed. 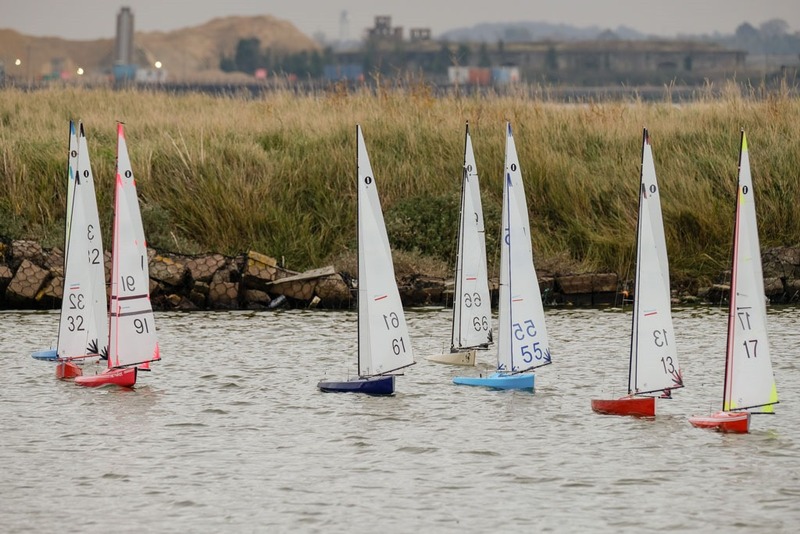 This event is open to all MYA members with registered DF65 and DF95 boats. Please use the MYA Online Entry Form where possible, or email John Newton (newtoj46@uwclub.net) or Geoff Appleton (geoff.appleton@blueyonder.co.uk), indicating which event(s) you are entering Please make sure you include your name, MYA No. ; Sail No(s); Frequency; emergency contact details and any health issues. There will be a skippers briefing at 09:45 on both days with the first race shortly after at about 10:00am. No race will start after 4:00pm and any race in progress at 4:30pm will be abandoned. MYA Standard Sailing Instructions (SSI’s) and DF Class rules will be used. Skippers are reminded they are required to sail in accordance with the RYA Racing Charter. 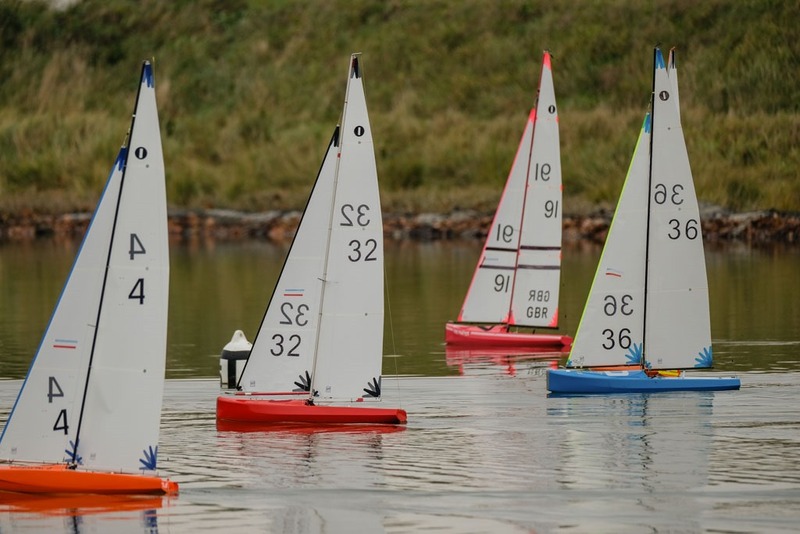 Norwich MYC will be hosting the Yare Cup for IOM Boats at their Whitlingham Country Park, Norwich NR14 8TR, venue on Sunday 4th March 2018. This event is open to all MYA members with a certified boat. Please use the MYA Online Entry Form if possible, or email Vinnie Zammit (vinnie.zammit@gmail.com). Please ensure you include your Name, MYA No., Sail No., Frequency, Hull type, Boat No., and Emergency Contact details and any health issues. There will be a skippers briefing at 09:45 with the first race shortly after at about 10:00am. No race will start after 3:30pm and any race in progress at 4:00pm will be abandoned. MYA Standard Sailing Instructions (SSI’s) will be used and skippers are reminded that they will be required to sail in accordance with the RYA Racing Charter. Report and Results courtesy of John Richmond. 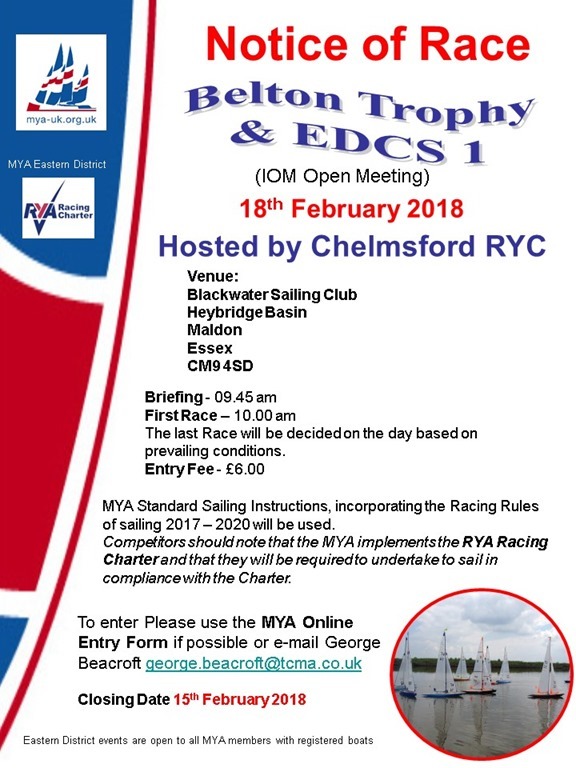 Chelmsford RYC will be hosting the Belton Trophy and round 1 of the Eastern District IOM Championship Series on Sunday 18th February 2018 at the their Blackwater Sailing Club venue. This event is open to all MYA members with a Certified IOM Boat and entrants should use the MYA online entry form where possible. If not, please email George Beacroft (george.beacroft@tcma.co.uk) and John Richmond (john.ers@talktalk.net) making sure to include, Name,; MYA No. ; Sail No. ; Frequency; Hull type; and Emergency Contact Name and Number. The current MYA Standard Sailing Instructions (SSI’s) will be used and skippers are reminded they should sail in accordance with the RYA Racing Charter. 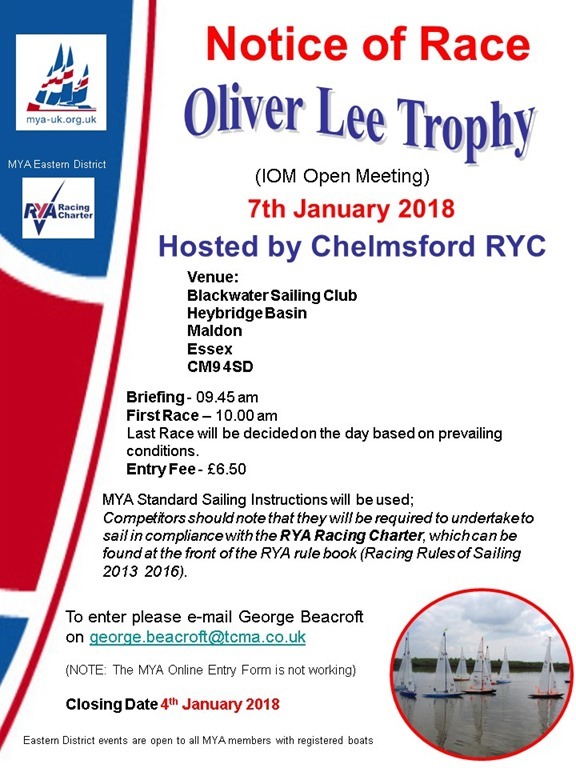 Chelmsford RYC will be hosting the annual Oliver Lee Trophy on Sunday 7th January 2018 at their Blackwater Sailing Club venue. This event, which is open to all MYA members with a certified IOM boat, normally has Mince Pies and Hot Mulled Wine so not to be missed! There will be a skippers briefing at 09:45am with the first race shortly after, about 10:00am. The last race will be decided on the day dependent on the prevailing conditions. MYA Standard Sailing Instructions (SSI’s) will be used and skippers are reminded that they will be required to undertake to sail in accordance with the RYA Racing Charter. 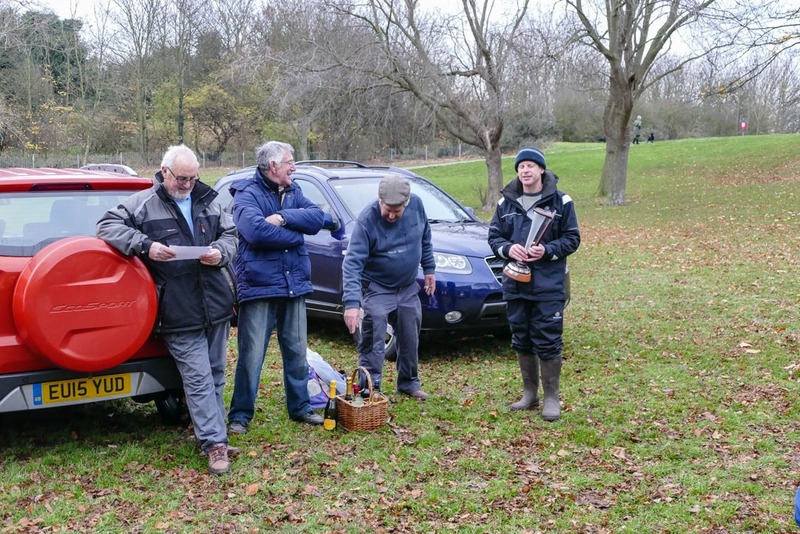 On Sunday 3rd December 2017 skippers arrived at Coalhouse Fort RYC for the annual Icicle Trophy on what initially was a cold day with very little if any wind. It was good to see a few new faces at an IOM Open event including, Gavin Print; Bryan Southgate and Dennis Graham. Unfortunately Dennis had a transmitter issue causing him to have to withdraw after Race 6. There were initially 19 entrants but due to illness this was reduced to 17 skippers from 6 clubs on the day. 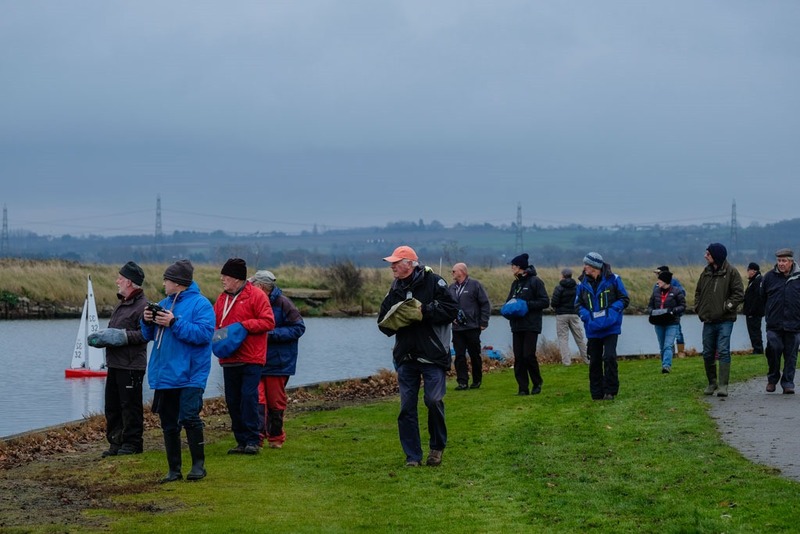 As the day went on the wind did increase slightly and was primarily from the North North West veering to North West and so Geoff Appleton, Race Officer for the day, set a windward/leeward course at the north end of the lake. Unusually, Colin Goodman did not have a normal day, taking 8 wins and was closely challenged at times by Trevor Binks, Vernon Appleton and Vinnie Zammit with 2 wins; and Graham Bartholomew and Gavin Print with 1 win. However, at the end of the day with his greater consistency as normal Colin was the overall winner with 18 points, followed by Trevor Binks with 40 points and Vernon Appleton third with 50 points. Despite initially little or no wind, the day ended with a good breeze and our thanks to all participants for their good behaviour with the only ‘protest’ being for redress. Our thanks to Malcolm Schaffer, Glenn Meekcoms and Peter Herbert for their valuable help throughout the day. Club Secretaries are reminded that MYA Affiliation Fees are due on 1st January 2017 - in order to ensure members receive their Yearbook early, these should be sent to the MYA Treasurer by 1st January 2017. Clubs are reminded that in order to be recognised an a MYA Affiliated Club they must have a minimum of two members who have paid their MYA membership Fee. Please take a look at the District Documents page for the latest versions of the Eastern District Constitution and the 2002 Trophy Series Rules as agreed on 2nd November 2013 at the Eastern District AGM. A copy of the new Racing Rules of Sailing 2013 - 2016 can be viewed on the 'Racing and Class Rules Guide' Page.